Good afternoon everyone! Been stuck in Upington with car trouble, had to get a new transfer box for the Landy! OUCH! The Landy purrs again and hopefully wont give us problems any time soon! Anyway, life goes on in the Kalahari, and the days are hot and humid, cloud cover every afternoon with heavy thunder and rainstorms in the evening! The first and last hour of the day are very important, because after the sun hits the dunes, everything that moves head for the shade, including the tourists! 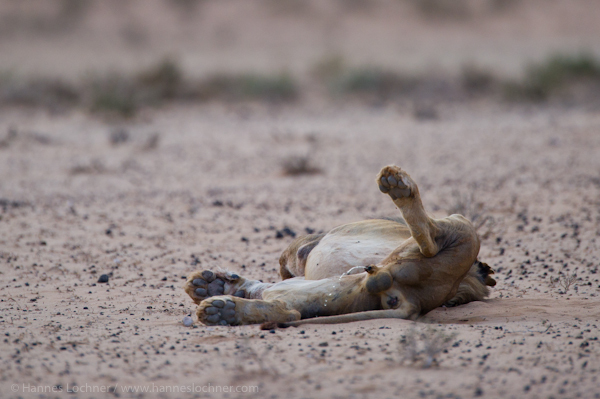 We share with you today a lazy, but comfortable male lion, too lazy to go to the loo, and just letting go! Why? King of the jungle of course! Ek Like dit, seker lekker dik gevreet ook…dis die lewe…love it…lekker dag vr julle groete uit ‘n waaarrrrm Sasolburg…..
Liewe land, dis OMTRENT lui!!! This entry was posted on 15/02/2012 at 14:41 and filed under blog.lochnerphoto.com. You can follow any responses to this entry through the RSS feed. You can leave a response, or trackback from your own site.